Are you using the P&G Shopper Card Coupons? Originally called P&GeSaver, the P&G Shopper Card Coupons is Procter & Gamble's online e-coupon application that is designed for shoppers using grocery store shopper's cards. The Shopper Card Coupons app allows shoppers to download all of the P&G coupons directly to their grocery store's shopper's card. 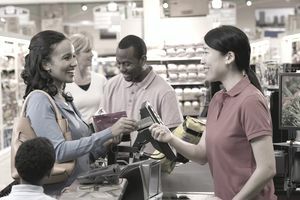 The cashier scans the card during checkout, and all of the applicable P&G coupons are automatically applied to the purchase. The program is restricted to members of P&G Everyday Solutions. Sign up is free and simple, and it can be done online at the P&G website. Go to the P&G Everyday Solutions website and either log in if you have an account or create an account. Next, select the "Coupons & Offers" tab at the top of the page and select the "Shopper Card Coupons" link. You will see a drop-down menu that is labeled "Pick a Retailer." Select the store where you use a store card and register the card information. It will bring you to another log-in page the first time that you register a store's card. You can now begin choosing the Shopper Card Coupons that you want to have loaded onto your card. After you click on the “Clip” button, the text will change from “Clip” to “Clipped." If you want a printed list of the coupons that you selected, go to the Shopper Card coupon homepage. Click on the “View Details” button in the shopper card information bar and click on the “Print” button in the window. You can view which Shopper Card Coupons are available at specific stores by completing the short registration form, adding your store cards to your profile, then clicking the "Available Coupons" link. You can also view which coupons you have downloaded by clicking on the "Selected Coupons" link. Each coupon can be downloaded one time on the card that you select. You can not download the same coupon onto multiple store cards. It will take about 15 minutes for newly selected coupons to activate so that they can be used at the store, so plan accordingly. Shopper Card Coupons cannot be printed to clip and use. To find paper P&G coupons, check product packaging, the Sunday paper, and the P&G website. While visiting the site, you see when your local paper will carry the P&G coupon booklets. P&G Everyday Solutions offers members coupons and free samples of P&G products. To view the free samples that are available, you simply log into P&GbrandSAMPLER and select which samples that you want to try. It generally takes about five to six weeks to receive the free samples. You can also select which coupons you would like for them to mail to you.